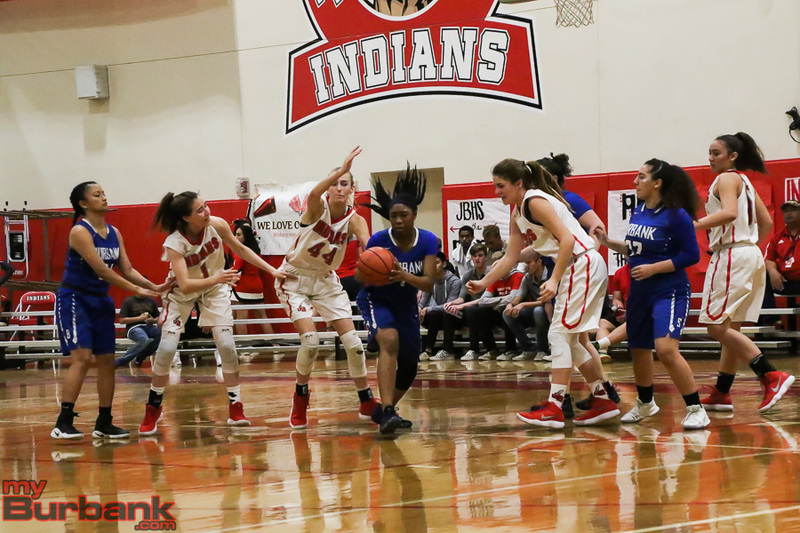 Basketball is usually filled with momentum shifts, and it was as a 20-point eruption in the second quarter by the Burroughs High girls’ basketball team helped tilt its Pacific League finale against host Burbank in favor of the Indians. 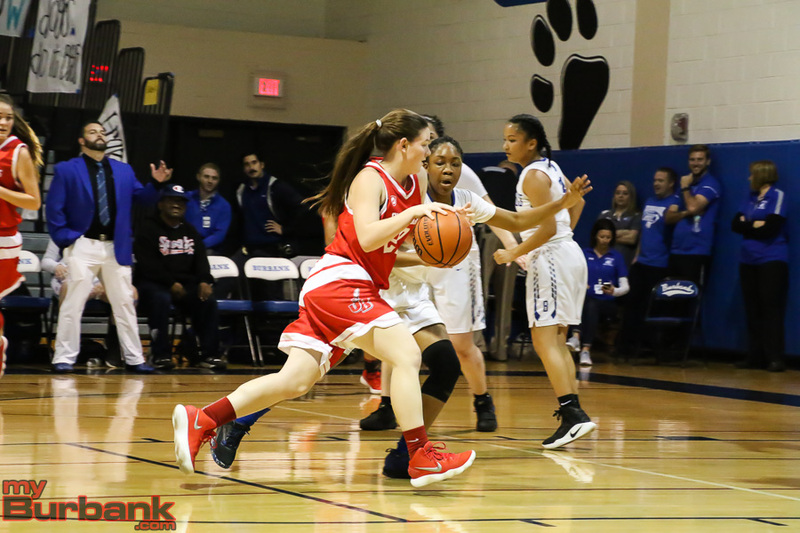 Kayla Wrobel, Nicole Rumfola and Faith Boulanger each dropped in 11 points in a 51-41 decision over the Bulldogs on Thursday night before a capacity crowd. Oganyan doesn’t mind using the bench and has confidence in that group. “We always tell them. Be ready to go. If your number gets called and you go in the game, it’s your opportunity to perform,” she said. 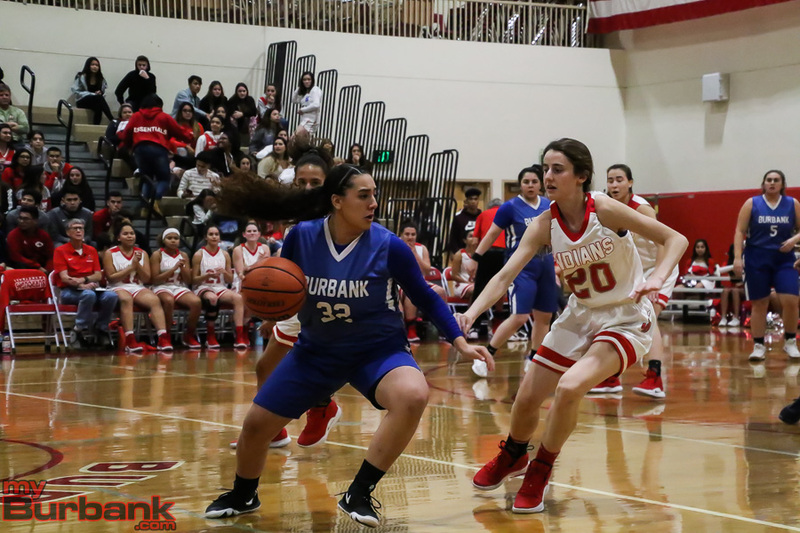 Burbank (15-13 and 6-8 in league) came out strong and took a 9-7 lead into the second quarter as four players scored, including senior swingman Osanna Tirityan, who tallied two of her game-high 20 points. Tirityan delivered 14 points in the second half. The Indians (21-7 and 10-4 in league), who outrebounded the Bulldogs, 41-30, hit seven of 15 attempts in the second quarter. Burroughs outscored Burbank 20-10 in the period and led 27-19 heading into the locker room. The Indians, who will likely play a CIF Southern Section playoff game on the road, committed eight turnovers at the half, but only three in the second half. 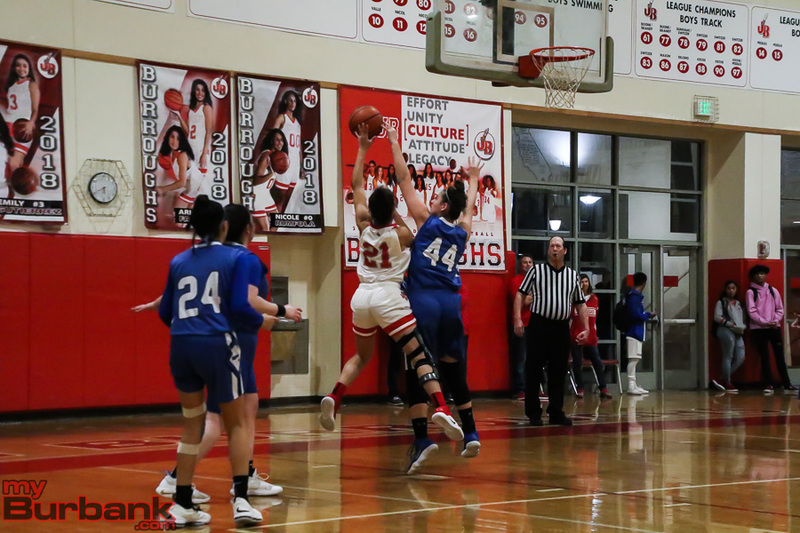 Six players scored for Burroughs, which ended the regular season with three consecutive victories after falling to visiting Crescenta Valley 32-29 on Jan. 22, including Jillian Kukawski, who had all eight points in the second frame. Kukawski, a senior shooting guard, nailed two key three-pointers and a hoop. A trey from Kukawski at the 4:40 mark made it 19-14 and Kukawski’s three-pointer with 2:10 left pushed the lead to 25-14. The third quarter belonged to Rumfola, a senior forward who scored six points as the Indians (34.6 percent on 17 of 49 from the field) forged ahead 40-31. Rumfola grabbed nine rebounds and handed out four assists while Wrobel, a sophomore power forward, snatched a game-best 14 rebounds. Tirityan tallied nine points in the third period for the Bulldogs (14 of 41 from the floor for 34.1 percent). Boulanger, a sophomore center, had seven points at the half and canned one of the six three-pointers made by Burroughs. 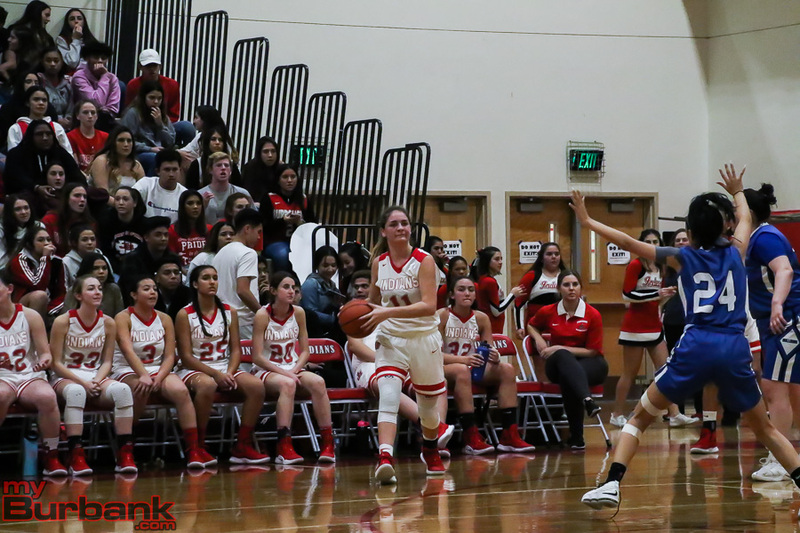 A third and final three-pointer from sophomore shooting guard Erika Montoya (nine points) sliced the Indians’ margin to 40-34 with 5:45 left, but Rumfola’s trey with 2:05 showing gave Burroughs a 48-38 advantage. 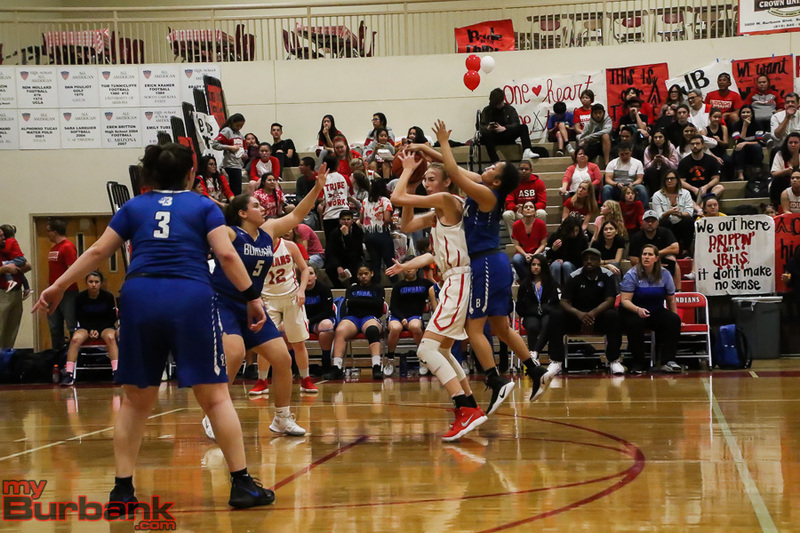 Neither squad was especially effective at the free-throw line as Burroughs made 11 of 24 for 45.8 percent and Burbank, which hit five treys and isn’t guaranteed a CIF playoff spot, connected on eight of 18 for 44.4 percent. 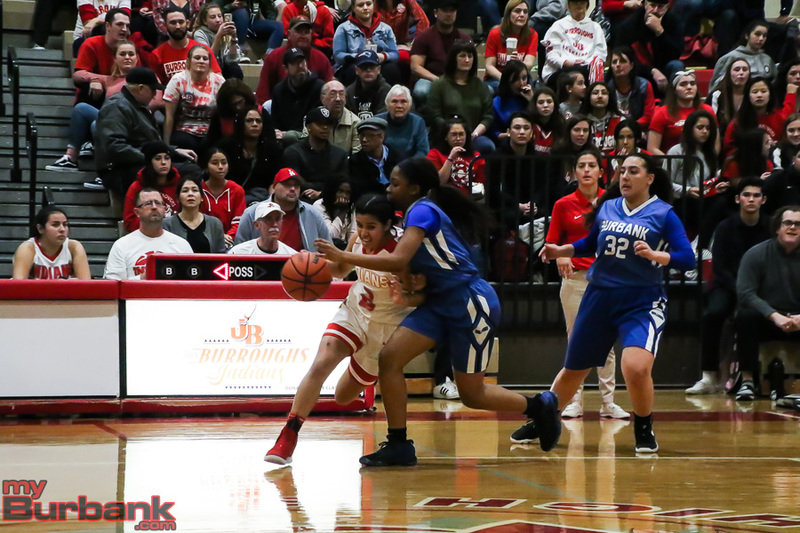 Junior guard Ariana Farias tossed in five points, junior guard A’sia Morales added four points and senior forward Jhazmin Piitts tacked on one point for the Indians. 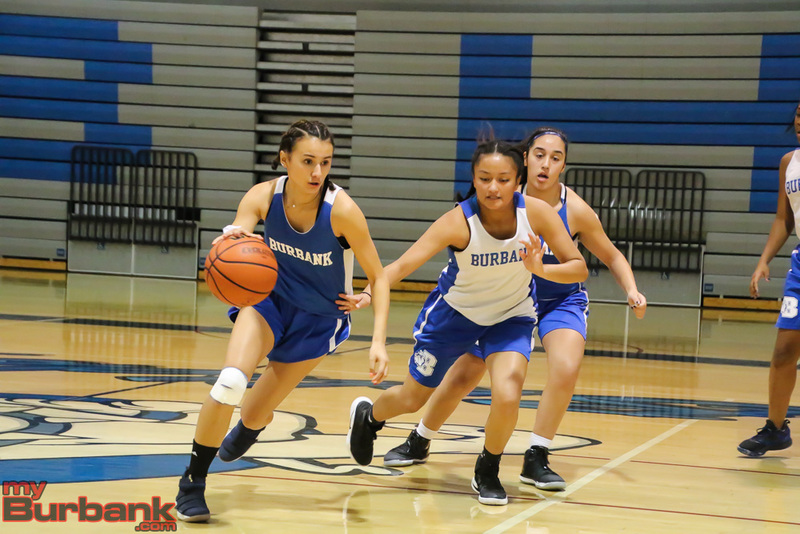 Senior center Sofia Aslanyan scored five points and junior guard Briana Castro had three points for Burbank. Sophomore small forward Jayla Flowers along with senior point guard Emily Monterrey each added two points for the Bulldogs. This entry was posted in Girls Basketball, Sports and tagged A'sia Morales, Ariana Farias, Briana Castro, Burbank High, Burroughs High, Emily Monterrey, Erika Montoya, Faith Boulanger, Jayla Flowers, Jhazmin Pitts, Jillian Kukawski, Kayla Wrobel, Nicole Rumfola, Osanna Tirityan, Pacific League, Sofia Aslanyan on February 1, 2019 by Rick Assad. 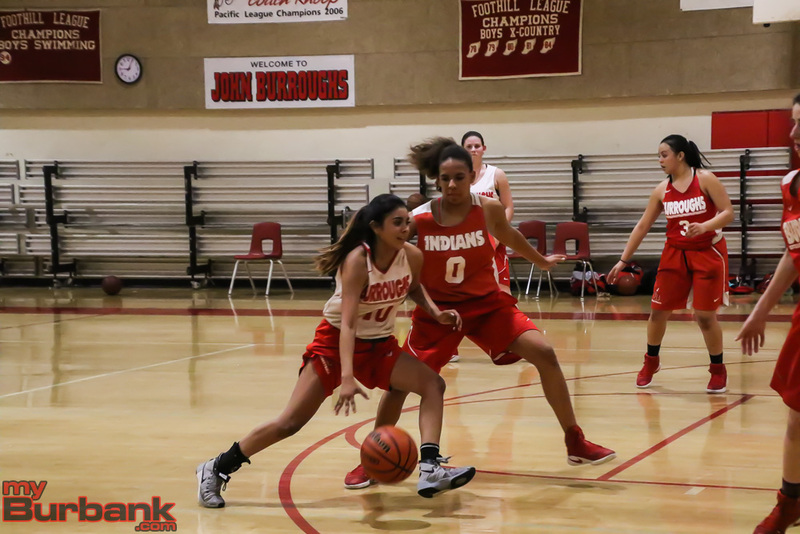 With the help of three players that reached double figures for the Burroughs High girls’ basketball team, the Indians were barely taxed in a showdown with city rival Burbank. 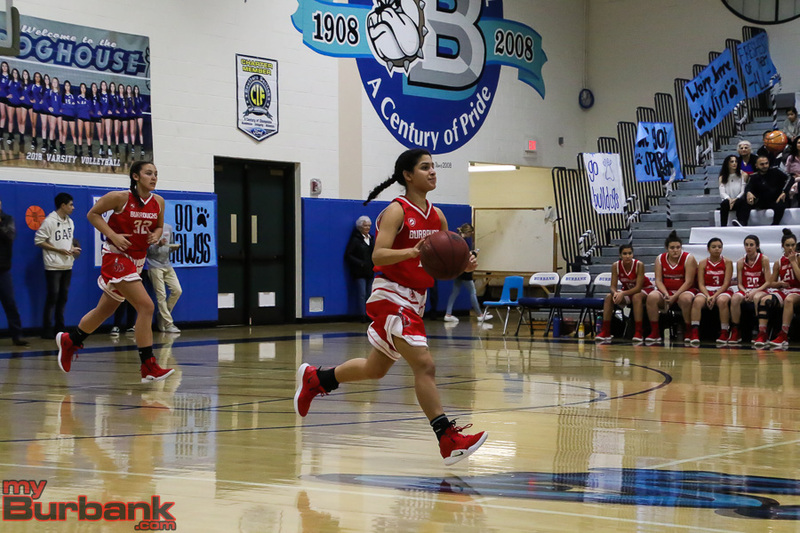 Behind Faith Boulanger’s game-best 20 points, host Burroughs cruised to an easy 71-34 win over the Bulldogs in a Pacific League match before a packed house on Friday night. Boulanger, a sophomore center, thought she played well, but said there’s room for improvement. 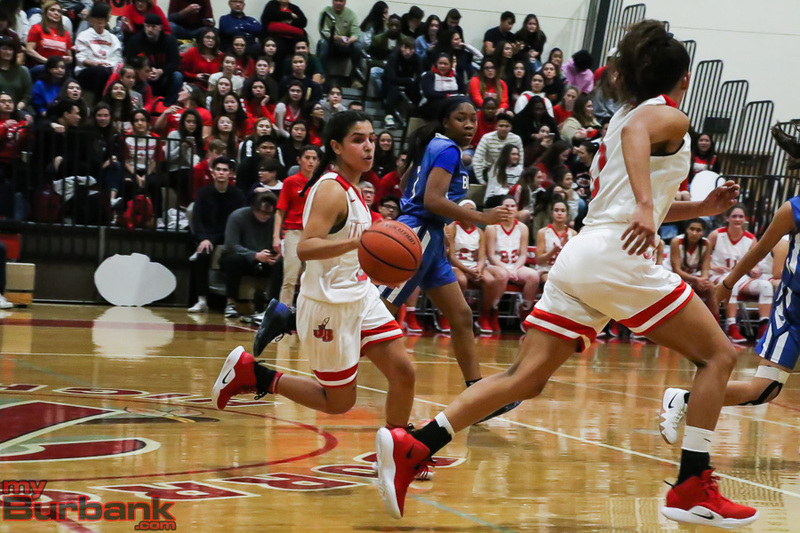 After hitting nine of 19 attempts in the first quarter, the Indians rolled ahead 20-10 with senior forward Nicole Rumfola (seven rebounds and four assists) scoring 11 of her 19 points while sophomore guard Dyani Del Castillo (14 points) dropped in five. Oganyan said the rivalry between Burroughs and Burbank is nice and certainly special, but you can’t make it bigger than what it is. The Bulldogs (13 of 40 for 32.5 percent) were held to four of nine from the floor in the first period as sophomore small forward Jayla Flowers (nine points) and senior swingman Tirityan (team-high 14 points) each scored three points. Boulanger canned a pair of three-pointers in the second quarter and had 10 points at halftime after tallying four points in the first period. The Indians (15-6 and 5-3 in league) converted 14 of 24 shots at the intermission and were ahead 33-20, while the Bulldogs (13-8 and 5-3 in league) made eight of 19. 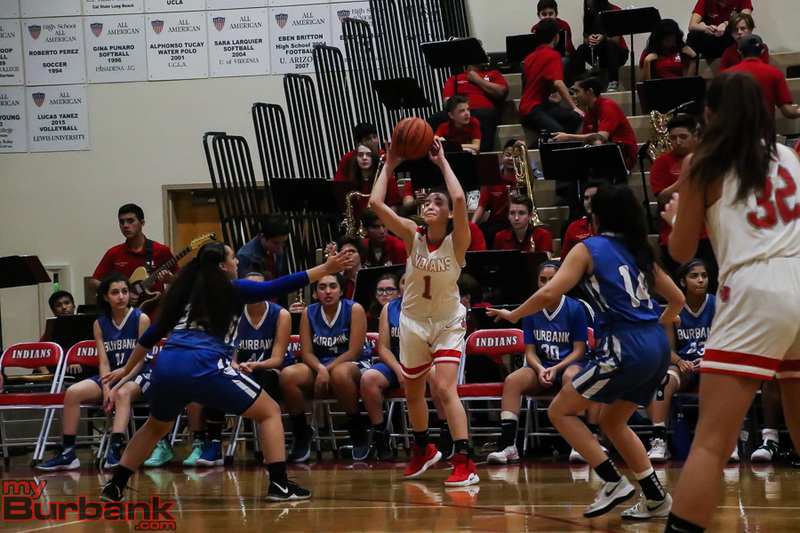 Del Castillo (six rebounds and four steals) nailed two of her four three-pointers in the third quarter and Boulanger added the third of four treys as the Indians hit five of 17 shots. 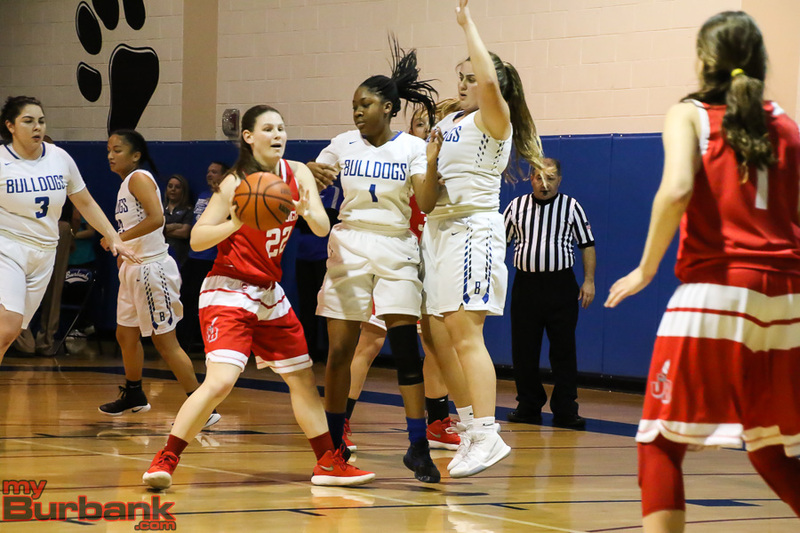 Flowers garnered four points in the third quarter for the Bulldogs, who will host the Indians on Jan. 31, and managed three of 11 from the floor and trailed 46-26 heading into the fourth quarter. “Jayla played well, but she still had moments I wished she did things differently. But this is high school basketball,” Del Mundo said. Nine players scored for the Indians (39.3 percent on 26 of 66 from the field) in the final frame with Boulanger scoring seven points and Rumfola dropping in four points. Burroughs, which made nine from three-point range, drilled 10 of 17 from the free-throw line (58.8 percent). Burbank, which hit two treys, made six of 12 (50 percent) from the charity line and was outrebounded, 40-32. Burroughs sophomore power forward Kayla Wrobel accounted for three points, but pulled down a game-best 11 rebounds. Senior point guard Ariana Farias scored four points and finished with five assists and five steals for the Indians. 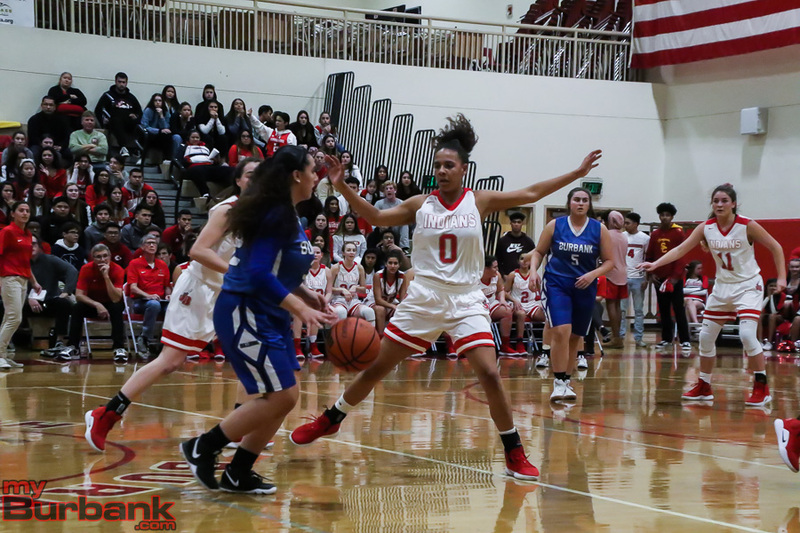 Junior guard A’sia Morales tossed in three points for Burroughs, sophomore Sydney Martin had three points while senior forward Emily Gutierrez and senior forward Jhazmin Pitts each tossed in two points and senior guard Jordyn Jackson had one point. 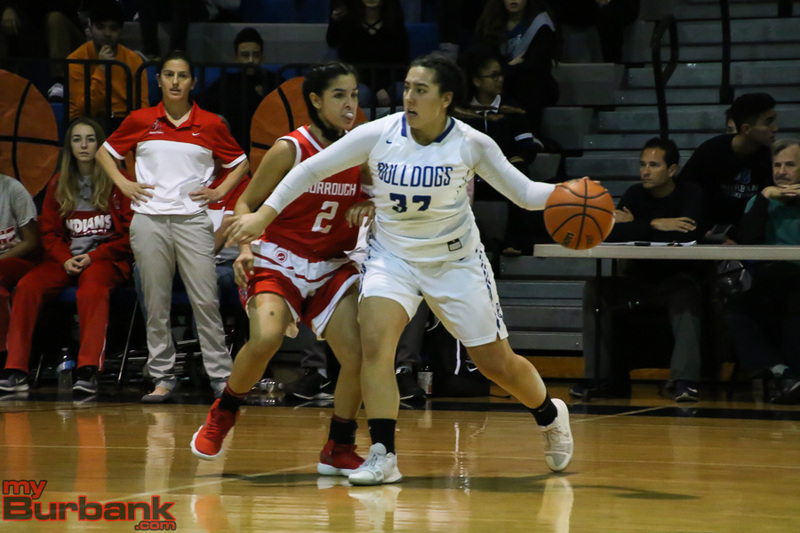 Senior point guard Jasmine Chavez tallied five points for the Bulldogs, senior center Sofia Aslanyan, junior guard Brianna Castro and junior Adel Bandarian all scored two points. 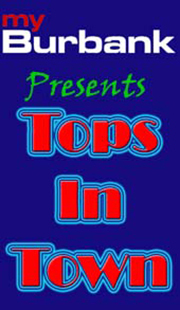 This entry was posted in Girls Basketball, Sports and tagged A'sia Morales, Adel Bandarian, Ariana Farias, Brianna Castro, Burbank High, Burroughs High, Dyani Del Castillo, Faith Boulanger, girls basketball, Jasmine Chavez, Jayla Flowers, Jhazmin Pitts, Jordyn Jackson, Kayla Wrobel, Nicole Rumfola, Osanna Tirityan, Pacific League, Sofia Aslanyan, Sydney Martin on January 12, 2019 by Rick Assad. 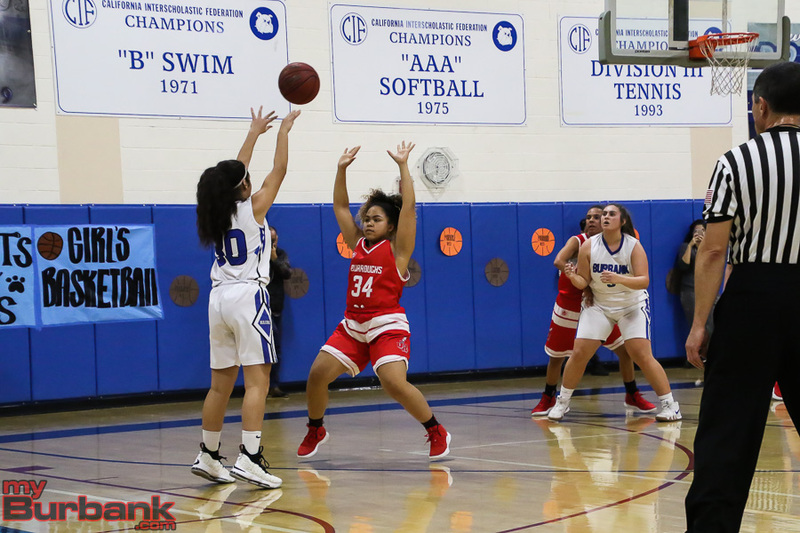 A longtime starter and a key reserve were at the heart of Burbank High’s 59-43 victory over visiting Muir in a Pacific League girls’ basketball game on Friday night. Senior center Sofia Aslanyan has been a three-year standout for the Bulldogs and was the offensive catalyst with a game-best 21 points, while sophomore small forward Jayla Flowers added five points, but more importantly grabbed key rebounds, handed out numerous assists and was a defensive sparkplug. Burbank, which made 23 of 75 shot attempts for 30.6 percent and pulled down 64 rebounds, took control early and was ahead 11-8 after eight minutes and bulled in front 26-16 at the intermission. A bucket by Aslanyan with 1:35 remaining in the second quarter gave the Bulldogs, who canned nine of 18 free throws, a 23-16 edge. The Bulldogs entered the fourth quarter ahead 39-32, but broke the contest open with a 20-point fourth quarter. 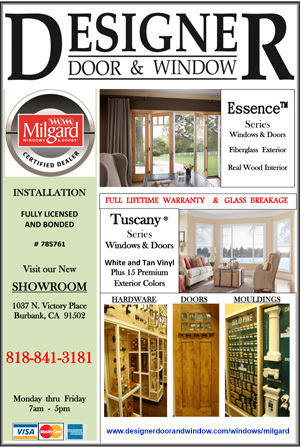 “I hate to say it, but during the season the third quarter has been the worst quarter,” said Del Mundo, who was Pasadena’s coach before coming to Burbank. 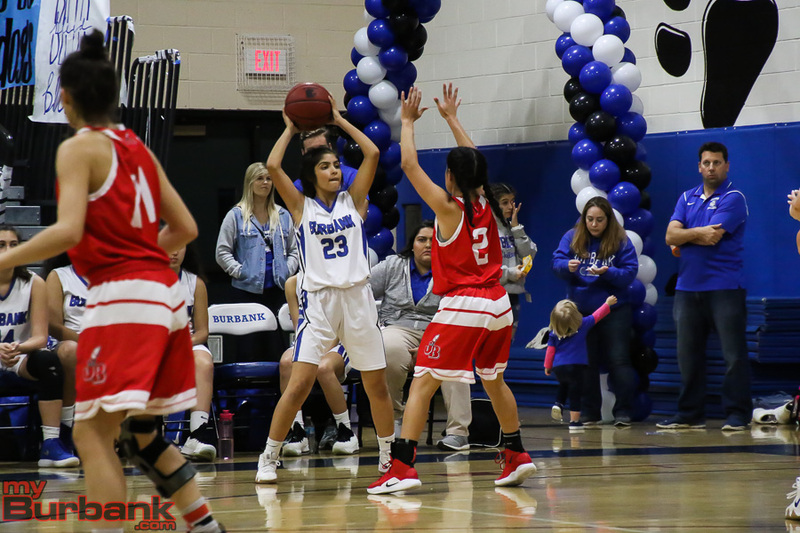 A three-pointer by junior shooting guard Brianna Castro (11 points) with 4:26 showing in the third period pushed Burbank’s advantage to 36-22. Tirityan’s hoop with 5:56 left on the ticker in the fourth quarter made it 46-33 and Castro’s third and final trey with 2:58 left in the fourth period made it 54-37. Aslanyan failed to score in the first quarter, but then tacked on nine points in the second period. Senior swingman Osanna Tirityan, who dropped in 14 points, tallied three points in the initial frame as the Bulldogs converted five of 22 shots (22.7 percent) from the field. 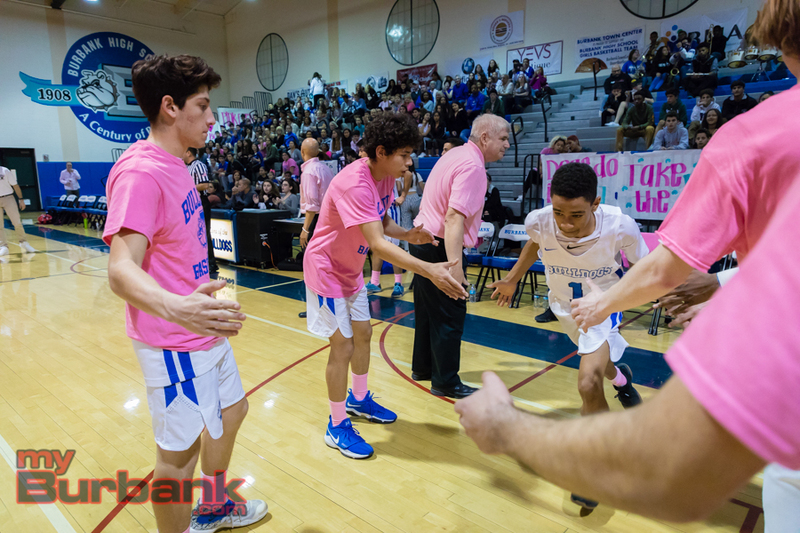 Tirityan added four points in the second quarter as Burbank (12-7 and 4-2 in league) made six of 19 (31.5 percent) from the floor. Muir (4-8 and 0-6 in league) was paced by first-year power forward/center Hodges, who dropped in 18 points, including 12 points in the second half. The Mustangs, who shot 24 percent (13 of 54) from the field and yanked down 37 caroms, came within seven points at the end of the third quarter and drew within six points, but then saw the Bulldogs pull ahead by 16 points. Muir, which drilled 16 of 26 from the charity line, rallied in the third quarter, outscoring the Bulldogs 16-13 with Hodges tallying seven points and sophomore guard Jori Haleakala-Denson dropping in six of her 12 points. Muir converted five of 28 shots (17.8 percent) in the opening half and improved slightly in the second half after hitting eight of 26 (30.7 percent). The Bulldogs were successful 0n five of 16 shots (31.2 percent) in the third quarter and seven of 18 (38.8 percent) in the fourth period. 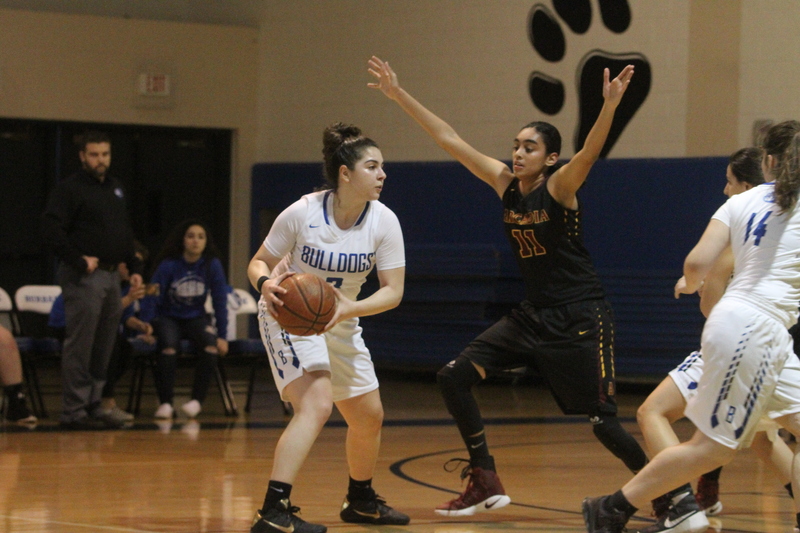 Senior point guard Emily Monterrey poured in five points for the Bulldogs, while junior center Adel Bandarian added two points and sophomore guard Erika Montoya tossed in one point. 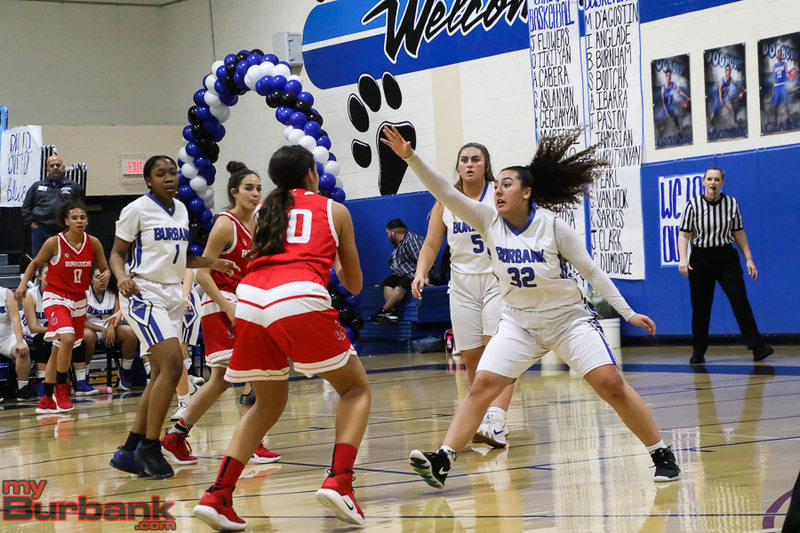 This entry was posted in Girls Basketball, Sports and tagged Adel Bandarian, Brianna Castro, Burbank High, Emily Monterrey, Erika Montoya, girls basketball, Jayla Flowers, Osanna Tirityan, Pacific League, Sofia Aslanyan on January 5, 2019 by Rick Assad. 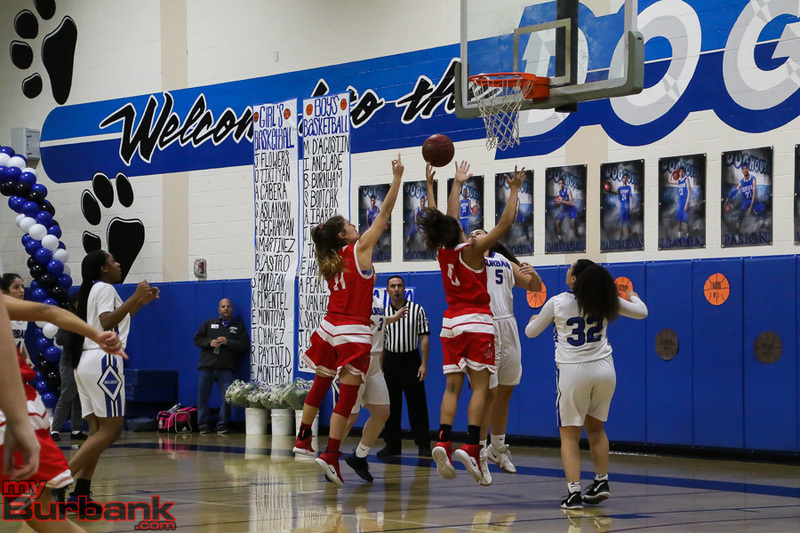 After a pedestrian 3-3 record to commence the Pacific League portion of its schedule, the Burroughs High girls’ basketball team rallied and ended with an eight-game winning streak that included a 54-41 victory over visiting Burbank on Thursday night. The Indians, with the triumph, are locked in a three-way tie with Glendale and Crescenta Valley, which fell to Arcadia 57-47. 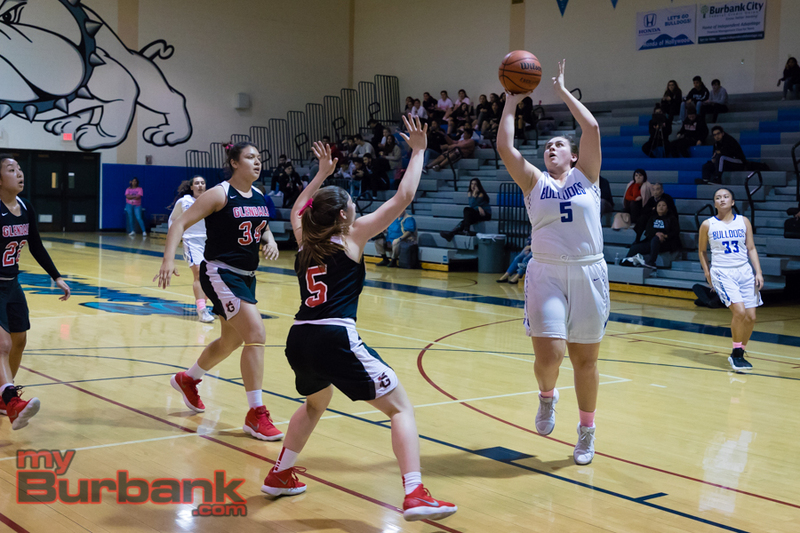 Backed by freshman power forward Faith Boulanger’s game-best 23 points, the Indians (21-7 and 11-3 in league) led from start to finish and now await Sunday’s CIF Southern Section playoff pairings. A coin flip will determine the actual order each team will finish and also help seed the squads. Boulanger scored in every quarter, but was especially effective in the first and fourth periods. 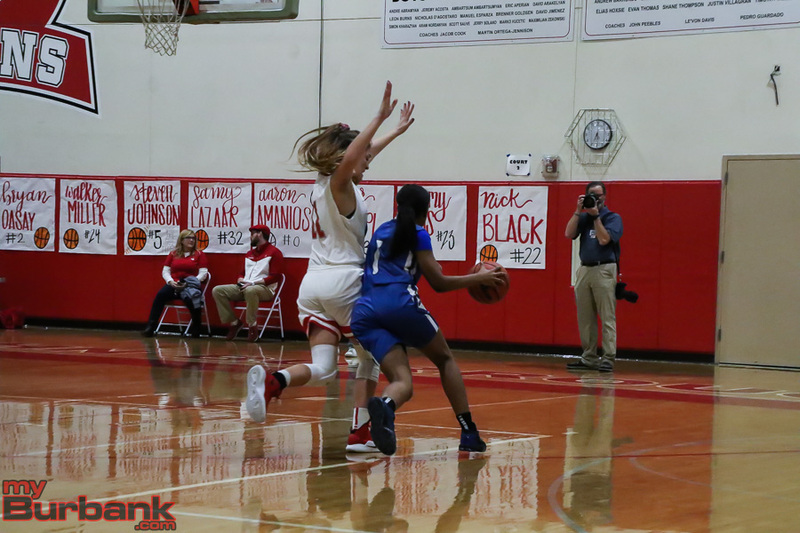 Burroughs darted ahead 39-29 with 6:15 left in the fourth quarter after junior shooting guard Jillian Kukawski (five points) canned a three-pointer. But with 4:19 remaining, a hoop from Burbank junior point guard Emily Monterrey (three points) trimmed the lead to 39-34. The Indians were in front 19-11 after the first quarter with Boulanger tallying eight points. Boulanger’s total offset Burbank freshman small forward Jayla Flowers, who had 10 of her team-best 15 points in the opening stanza. Wells noted the game after Monterrey’s hoop could have gone either way. In the initial frame, senior center Marin Grote (eight points) and junior point guard Ariana Farias (nine points with five assists) each scored four points for the Indians, who shot 37.2 percent (19 of 51) from the field. 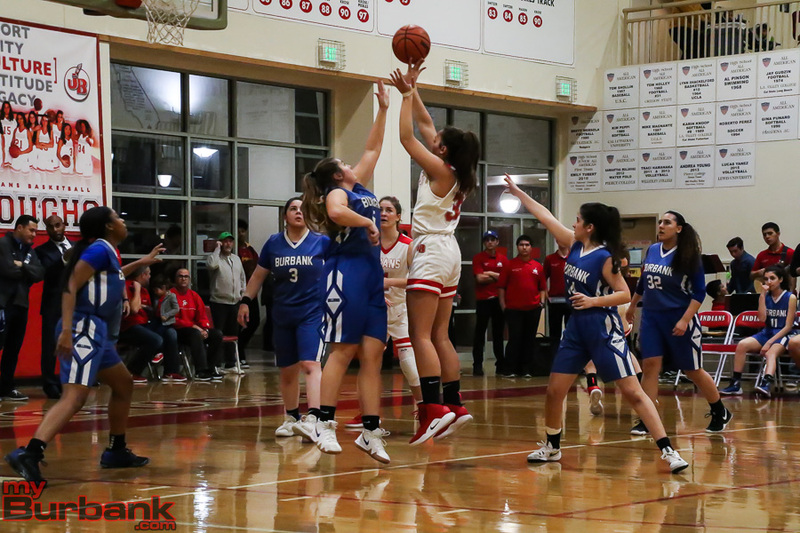 Burroughs was held to eight points in the second quarter with Boulanger and Farias each dropping in three points, while freshman power forward Kayla Wrobel scored two points. 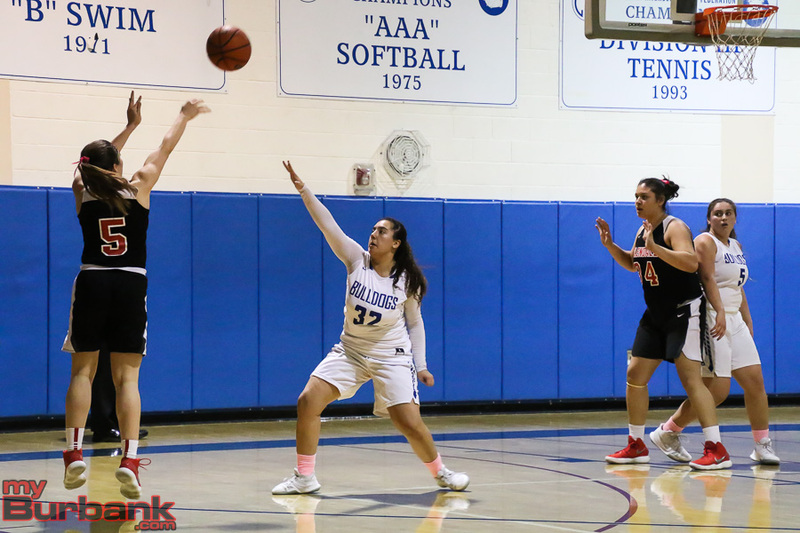 Flowers delivered four points in the second quarter, while junior shooting guard Osanna Tirityan had two of her 11 points for the Bulldogs, who made 15 of 49 for 30.6 percent. 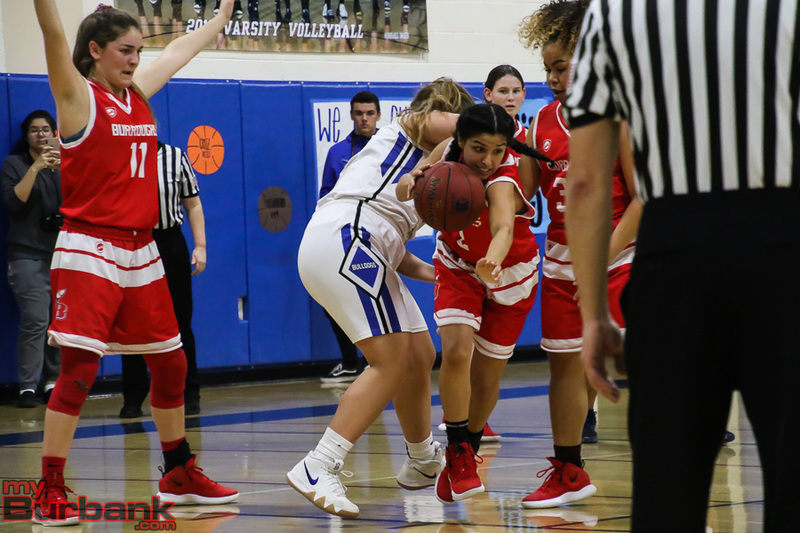 Burbank outscored Burroughs 10-9 in the third quarter with Tirityan and junior power forward Sofia Aslanyan (12 points and six rebounds) each tallying four points and trailed 36-29 heading into the fourth quarter. Boulanger’s seven points in the fourth period helped the Indians outscore the Bulldogs 18-12. 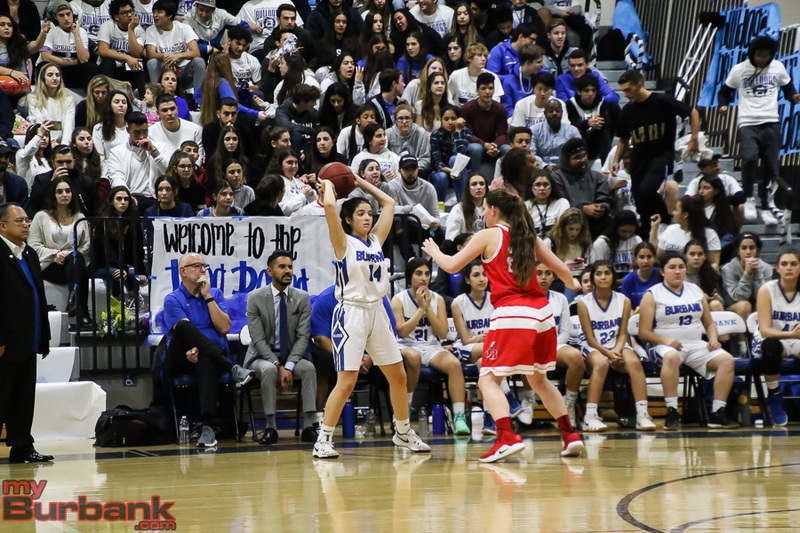 Meanwhile, Aslanyan accounted for six points and Tirityan, an All-CIF performer last season, pulled down six rebounds and added four points in the final period. 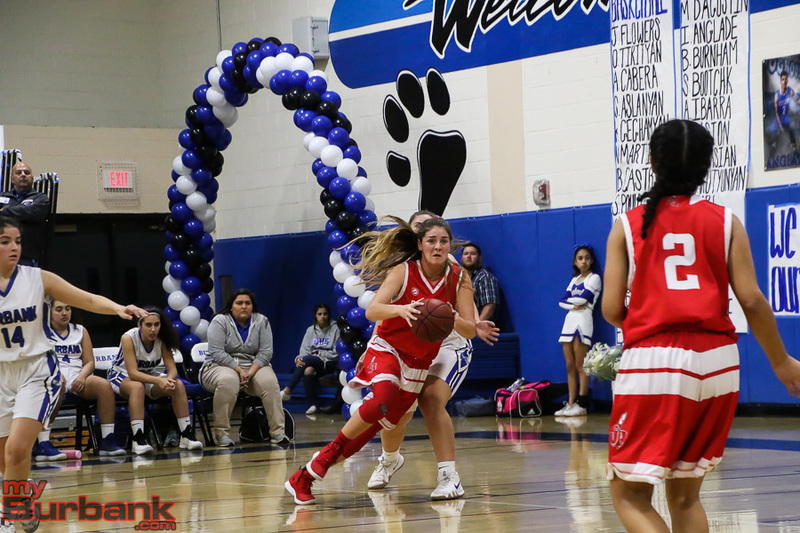 Burroughs freshman shooting guard Dyani Del Castillo scored four points including a trey in the first quarter and senior point guard Jenny Galvan contributed a three-pointer in the fourth quarter. The Indians were successful on 11 of 15 from the free-throw line. The Bulldogs made 11 of 22 and were outrebounded 39-33. This entry was posted in Girls Basketball, Sports and tagged Ariana Farias, Burbank High, Burroughs High, Dyani Del Castillo, Emily Monterrey, Faith Boulanger, girls basketball, Jayla Flowers, Jenny Galvan, Jillian Kukawski, Kayla Wrobel, Marin Grote, Osanna Tirityan, Pacific League, Sofia Aslanyan on February 9, 2018 by Rick Assad. 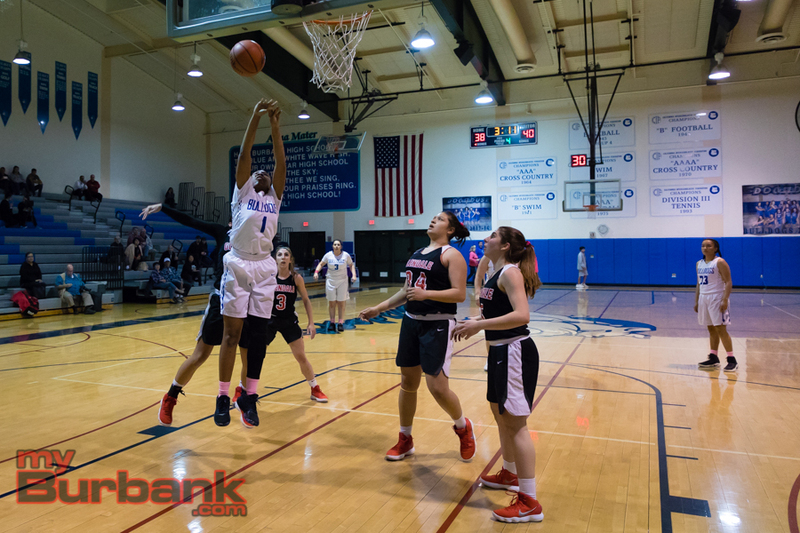 The effort was certainly there and the atmosphere appeared to favor the Burbank High girls’ basketball team at home Friday evening when the Bulldogs hosted Glendale High in a Pacific League contest. But the Nitros and Jillian Yanai had other things in mind, as the senior guard led Glendale to a 52-49 victory. Yanai kept the Nitros (16-7 overall, 8-1 in the league) in the game by hitting some clutch shots. She finished with a game-high 29 points. “I’ve been working on it for a very long time, so I’m glad it came through tonight,” Yanai said of her shot. 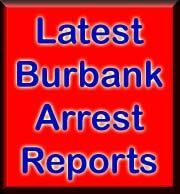 Burbank (9-14, 4-5 in the league) actually led at the end of the first quarter, 12-8, and at halftime, 21-19. Both teams fought back in the third quarter as the lead changed four times. Burbank last led with 3:15 left in the quarter when Osanna Tirityan hit a free throw to make it 30-29. 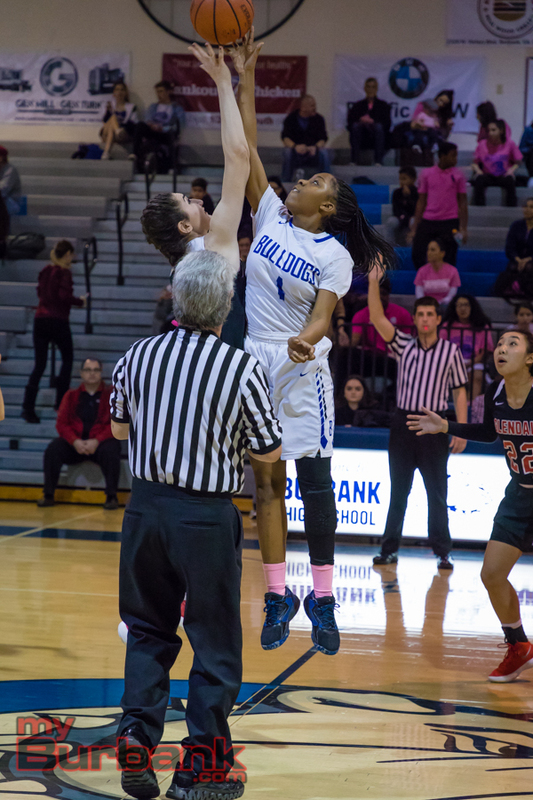 She led Burbank with 22 points. Burbank tied things up at 38 with 5:53 to play as Emily Monterrey’s shot banked in off the glass. The Bulldogs got within two points with 1:32 to play on a basket by freshman Jayla Flowers. After a Burbank timeout, Yanai completed a three-point play for the Nitros to push the lead to 47-42. 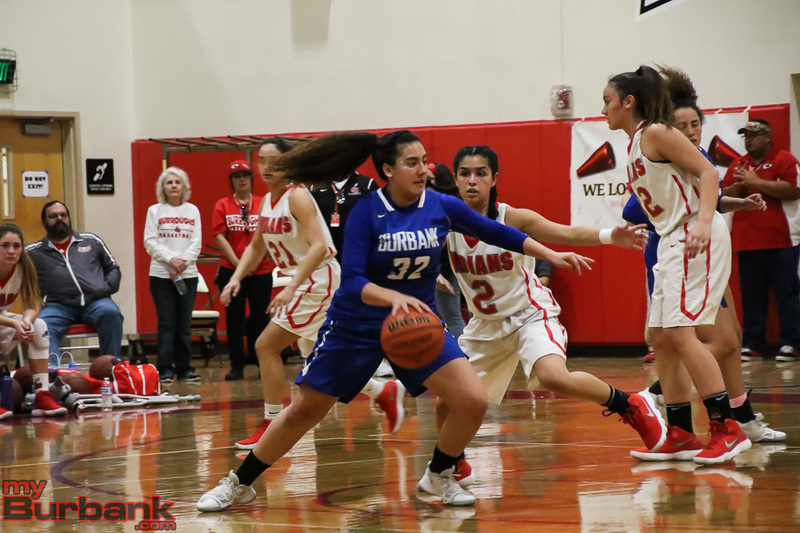 Burbank made a late push with a three-pointer from Tirityan and a basket by Sofia Aslanyan. But the Bulldogs were unable to get a shot off after Glendale missed a free throw with 1.7 seconds left. The Bulldogs got 11 points from Sophia Jimenez. Flowers finished with eight points and Aslanyan had six points. Monterrey had two points. 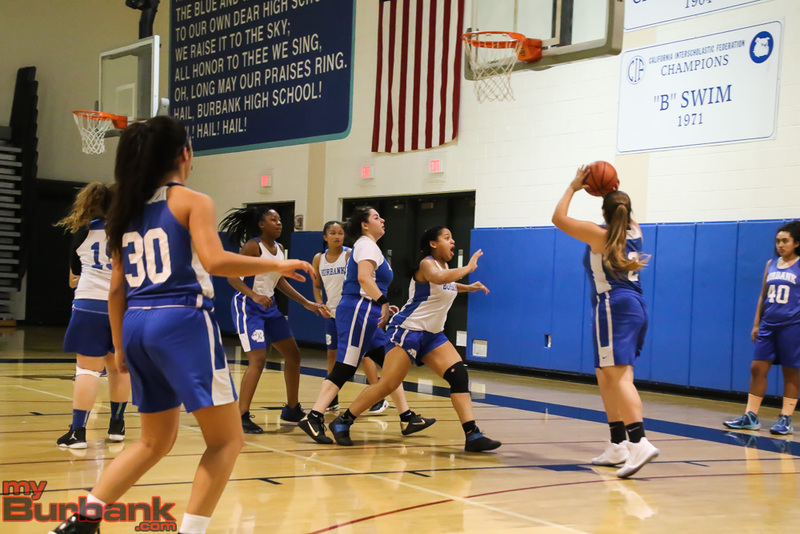 This entry was posted in Girls Basketball and tagged Burbank Girls Basketball, Emily Monterrey, Jayla Flowers, Osanna Tirityan, Sofia Aslanyan, Sophia Jimenez on January 27, 2018 by Jim Riggio. 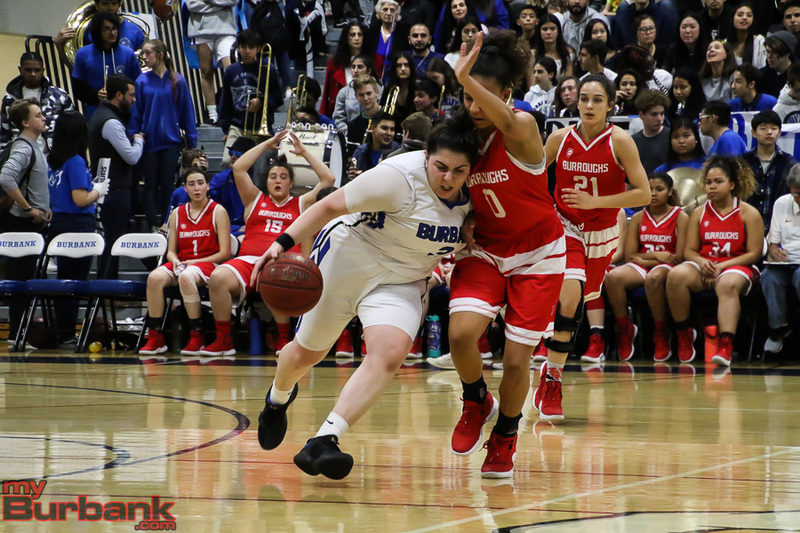 It wasn’t too difficult to figure out that the Burroughs High girls’ basketball was going to double-team Burbank’s Osanna Tirityan and force others to beat them. 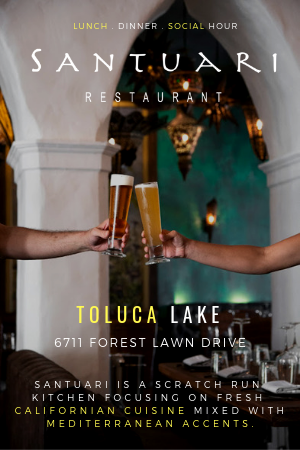 For the most part, the tactic worked because the visiting Indians prevailed 54-42 in a Pacific League contest on Friday night. Even with two defenders draped all over Tirityan, the junior shooting guard managed to pour in a game-best 19 points for the Bulldogs, who had only three players score. 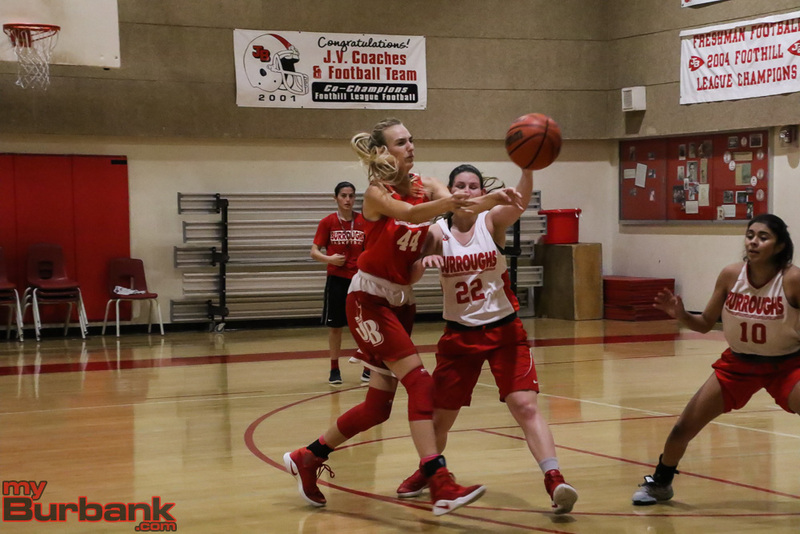 Burroughs (13-8 and 4-3 in league) had seven players score including freshman power forward Faith Boulanger, who tallied a team-high 18 points and grabbed six rebounds. 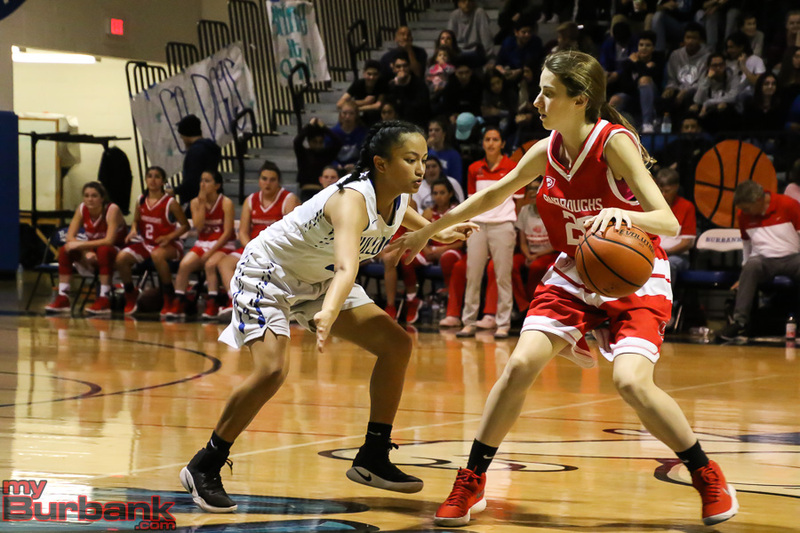 Burroughs freshman shooting guard Dyani Del Castillo finished with 10 points and seven caroms and freshman power forward Kayla Wrobel, who didn’t score, pulled down seven boards. Aside from the opening four minutes, the Indians controlled much of the tempo and probably played their best league game. “As far league, I would say yes, but we’ve had other moments in the season,” Oganyan said. 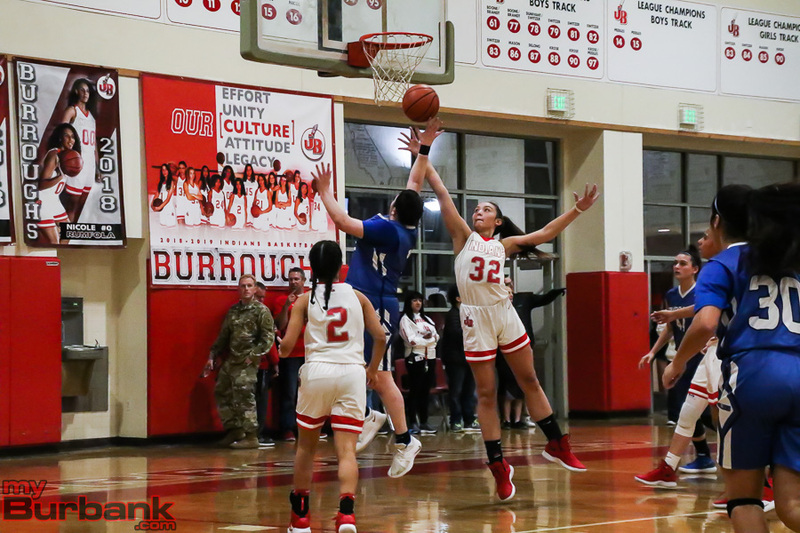 Burroughs outscored Burbank in every frame except the third when Burbank (8-13 and 3-4 in league) dropped in 13 points while limiting the Indians, who shot 35.9 percent (23 of 64) from the field, to seven points. Behind seven points from Boulanger and four points from junior shooting guard Jillian Kukawski (nine points), the Indians powered ahead 16-11 in the first quarter. The Bulldogs actually led 8-0 on a follow-up bucket from Tirityan with 5:20 left in the initial period, but the Indians then outscored the Bulldogs 16-3. The Indians pulled ahead 24-15 with 3:40 left on the clock in the second period on a put-back from Boulanger. When senior center Marin Grote (four points, nine rebounds and five assists) scored from close range and 1:59 left in the second quarter, the Indians moved ahead 28-15. The Indians made 15 of 36 shots at halftime and were in front 32-15, while the Bulldogs (32.6 percent on 15 of 46) hit six of 20 at the break with junior power forward Sofia Aslanyan tallying eight of her 15 points. In the third period, the Indians made two of 13 from the floor and one of four from the free-throw line. The Bulldogs hit five of 11 from the field, two of two from the charity stripe and came within 39-28 heading into the fourth quarter. The Indians, who drained six three-pointers compared to two for the Bulldogs, righted the ship in the final frame, making six of 15 and saw junior point guard Ariana Farias score six of her eight points after hitting a pair of three-pointers and Boulanger tallying six points. Freshman small forward Jayla Flowers tacked on eight points for the Bulldogs, seven coming in the second half. The Bulldogs converted 10 of 18 free throws and committed 13 turnovers while the Indians hit two of six free throws and also had 13 turnovers. 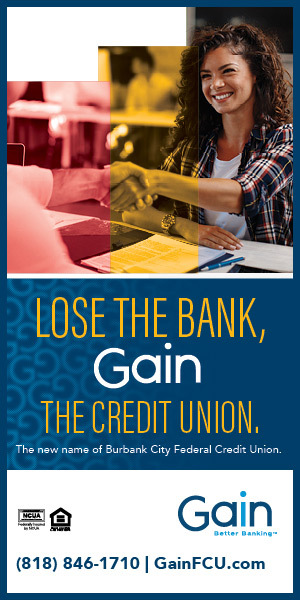 This entry was posted in Girls Basketball, Sports and tagged Ariana Farias, Burbank High, Burroughs High, Dyani Del Castillo, Faith Boulanger, girls basketball, Jayla Flowers, Jillian Kukawski, Kayla Wrobel, Marin Grote, Osanna Tirityan, Pacific League, Sofia Aslanyan on January 20, 2018 by Rick Assad. 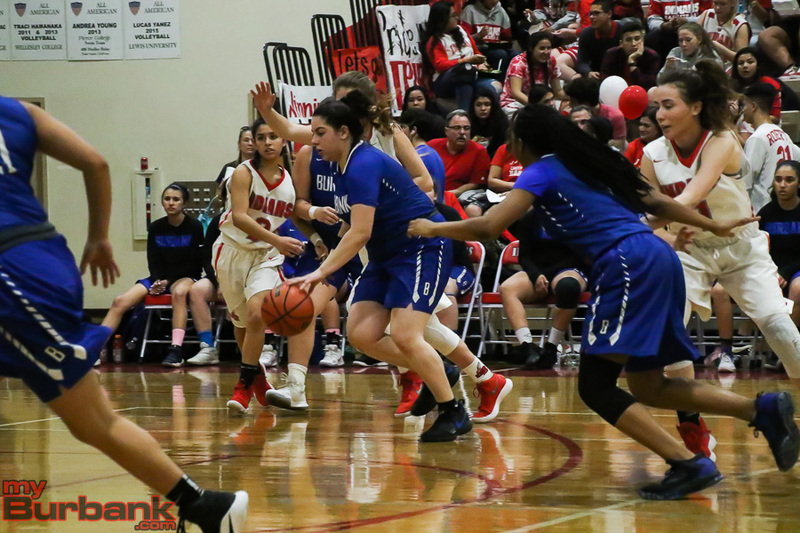 It’s quite likely Burbank High’s Osanna Tirityan and Glendale’s Jillian Yanai are the two best female basketball players in the Pacific League. On Friday night, these two faced each other and neither disappointed, but it was Yanai’s co-game-high 14 points and nine rebounds that helped push the host Nitros past the Bulldogs, 55-44. Tirityan, a junior shooting guard and All-CIF Southern Section selection, had 11 points after scoring two points at the intermission. 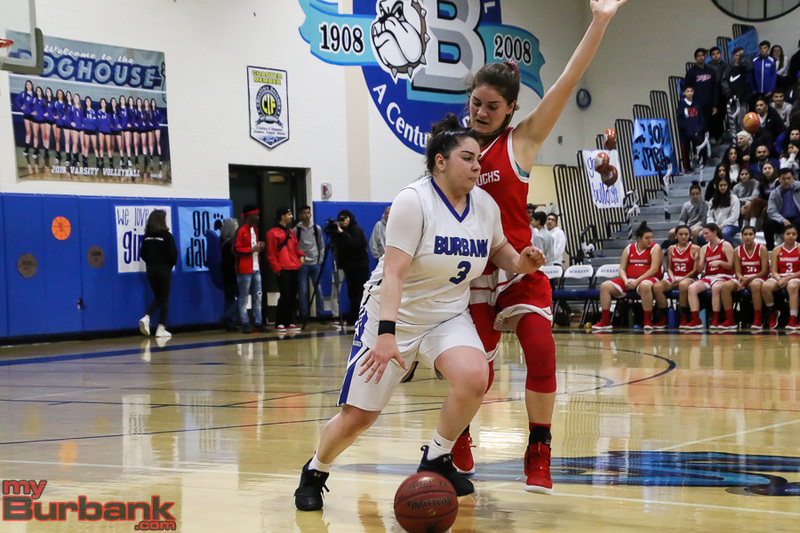 Junior power forward Sofia Aslanyan added a team-best 12 points for Burbank, which made 13 of 48 of its shots from the field for 27 percent. Yanai, a senior shooting guard, was held scoreless in the first quarter as the Nitros led 12-9 heading into the second frame, but exploded for eight points that included a three-pointer, as Glendale seized control 24-19 at halftime after drilling 10 of 28. 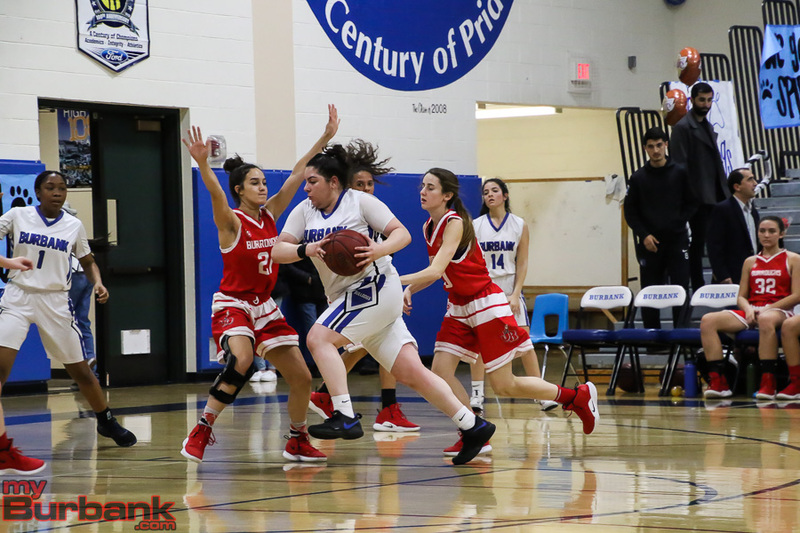 Sophomore power forward Mary Markaryan also scored 14 points with nine caroms for the Nitros and junior point guard Meri Chebishian tossed in 13 points, with two shots coming from three-point range. Glendale’s best quarter was the third when it canned seven of 16 from the floor and four of seven from the free-throw line, and took a 44-31 advantage into the fourth period. Glendale made 11 of 19 (57.8 percent) of its free throws and Burbank hit 15 of 24 (62.5 percent). 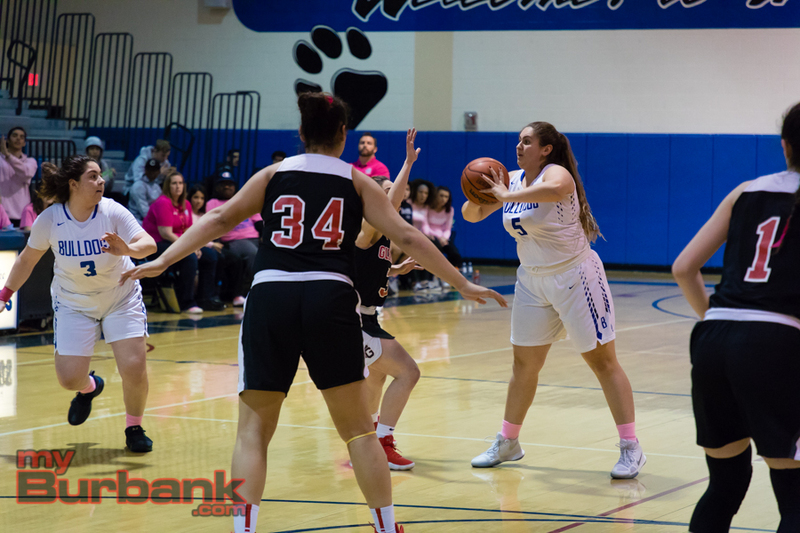 Sophomore center Melissa Zamora accounted for all of her six points in the third quarter for the Nitros (10-6 and 2-0 in league), who outscored the Bulldogs 20-12. Vasghanian scored four points for the Nitros, who advanced to the CIF Division II-A semifinals last season, that included a three-pointer in the third quarter. The Bulldogs were sloppy with the ball, turning it over 19 times while the Nitros had 10. 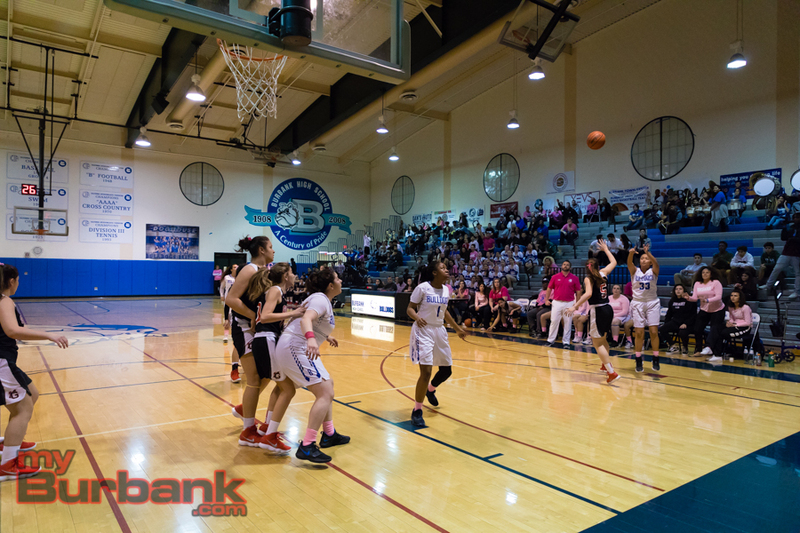 Burbank (6-10 and 1-1 in league) limited Glendale to 11 points in the fourth quarter on three of 13 from the floor, but five of eight from the charity line, while scoring 13 points on three of 13 from the field and seven of nine free throws. Tirityan came out and passed the ball in the opening half, even though she’s capable of tallying double-digits every game. With only two points in the first quarter and being blanked in the second frame, Tirityan, who pulled down nine rebounds, scored four points in the third quarter and five points in the final frame. 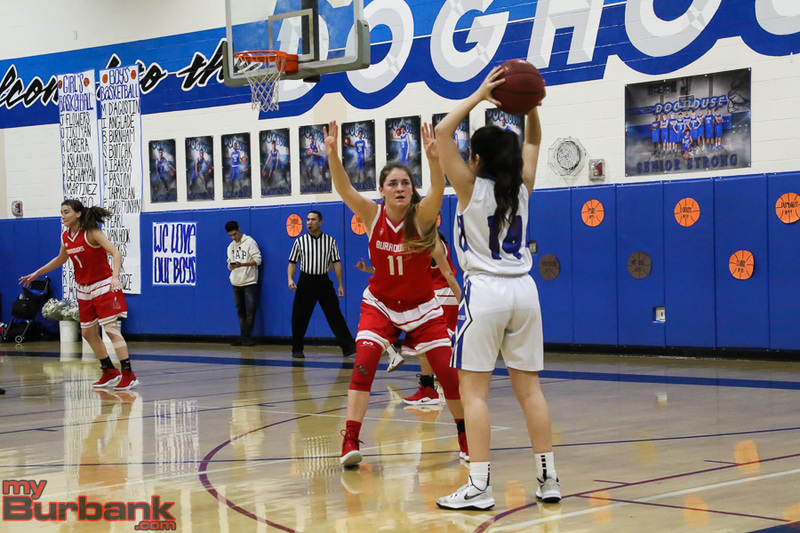 When Burbank sophomore point guard Brianna Castro (eight points) nailed a three-pointer with 6:05 left in the second quarter, Glendale’s lead was sliced to 16-14. With 6:25 remaining in the third quarter, a hoop from Chebishian pushed the Nitros (20 of 57 for 35 percent) ahead 29-23. 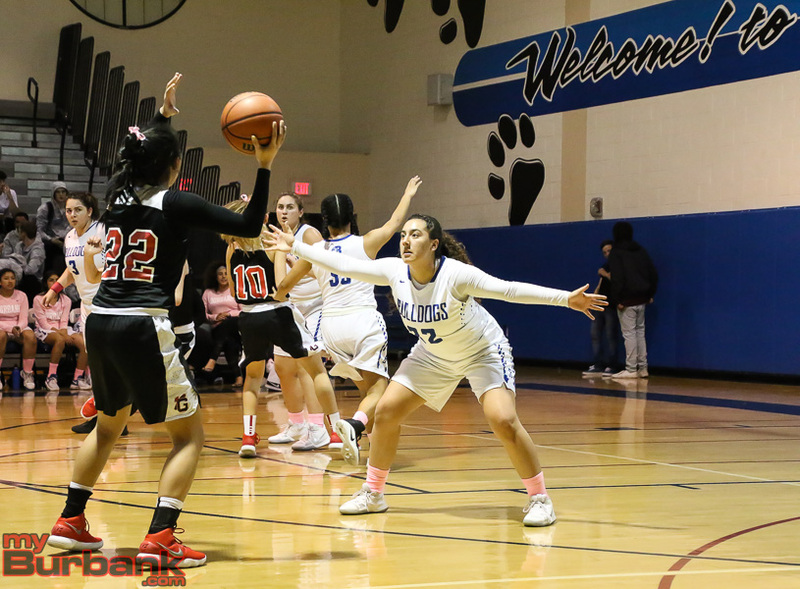 This entry was posted in Girls Basketball, Sports and tagged Brianna Castro, Burbank High, girls basketball, Osanna Tirityan, Pacific League, Sofia Aslanyan on January 6, 2018 by Rick Assad. 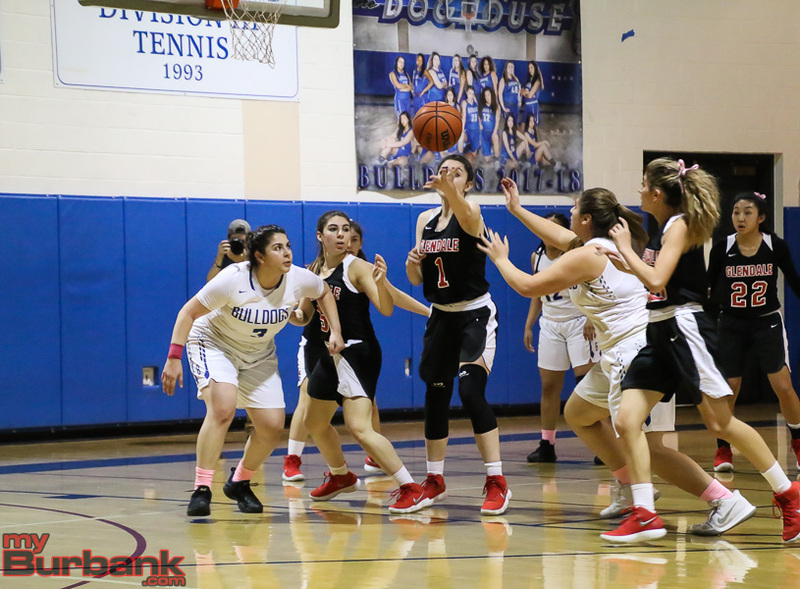 Two solid quarters couldn’t offset two poor stanzas by the Burbank High girls’ basketball team which fell to Westchester 46-32 in Thursday night’s consolation game of the 2017 West Coast Holiday Festival at the Bulldog gym. 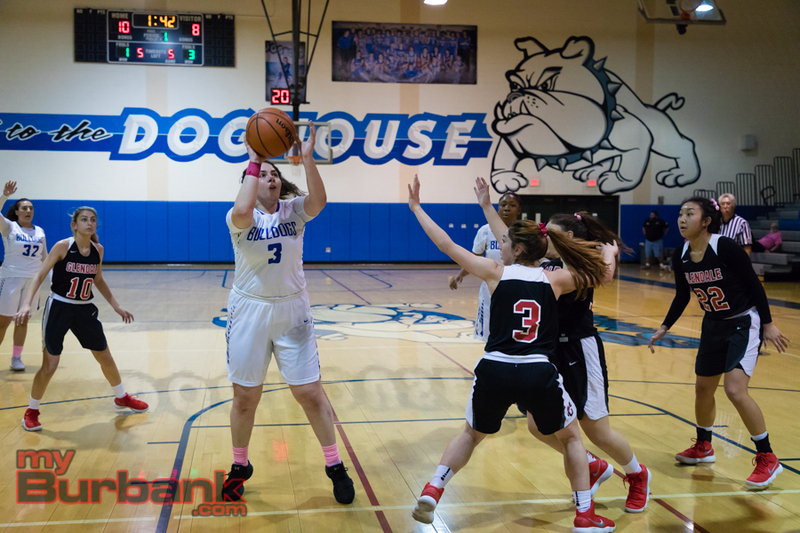 Junior shooting guard Osanna Tirityan delivered a team-best 15 points with eight rebounds and four assists for the Bulldogs (4-8), who trailed at halftime and the end of the third quarter. Tirityan’s scoring output was doubled by the 6-foot, 3-inch junior center Destiny Brown, who poured in a game-high 30 points, including 22 points in the opening half when the Comets (10-1) pulled ahead 26-19. Agile, quick and athletic, many of Brown’s points resulted from follow-up opportunities, so even if Brown missed her initial shot, she would spring up and grab the rebound and toss it toward the hoop and if it failed to find the mark, she’d repeat the process. The first period was knotted at 14-14 behind Burbank freshman small forward Jayla Flowers, who tossed in all of her five points while Tirityan added five that included the first of four three-pointers. The Bulldogs, who will likely play Cleveland in another consolation match on Friday, shot 23.5 percent from the field (12 of 51), were hard pressed to locate the basket in the second quarter, making two of 10 and tallying five points. Tirityan found the range and drilled a trey in the second period and junior power forward Sofia Aslaynan (nine points) knocked in a hoop and tallied six points at the break. In the second quarter, the Bulldogs turned the ball over eight times and had 15 miscues overall while the Comets committed 13 turnovers. 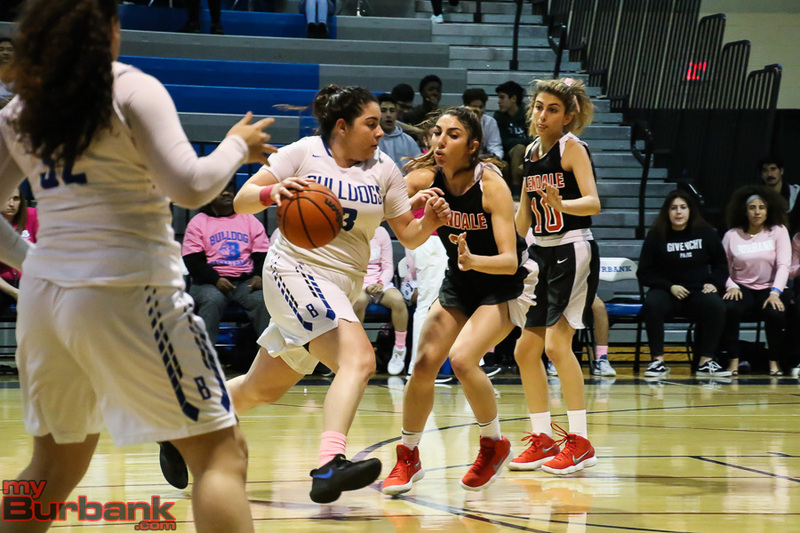 Senior point guard Sophia Jimenez was the only other Burbank player to score as she dropped in three-pointer in the fourth quarter. Burbank was outrebounded by Westchester 49-38, and shot 33.3 percent from the floor at the half (eight of 24). The Comets hammered in 10 of 35 attempts from the field for 28.5 percent at halftime and outrebounded the Bulldogs 26-18. Burbank missed all 15 shots in the third quarter with the only scoring coming at the free-throw line as Aslanyan and Tirityan each made one. 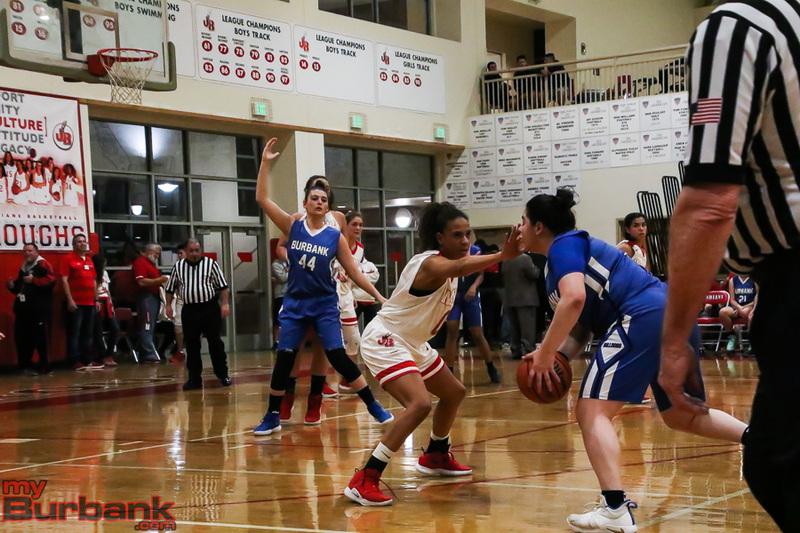 Brown was up to her old tricks in the third frame as she accounted for six points as the Comets finished with 13 points and led 39-21 heading into the final quarter. Burbank bounced back with a better fourth period, making four of 12 from the floor and limiting Westchester (29.5 percent on 18 of 61) to three of 12 with Brown scoring two points. 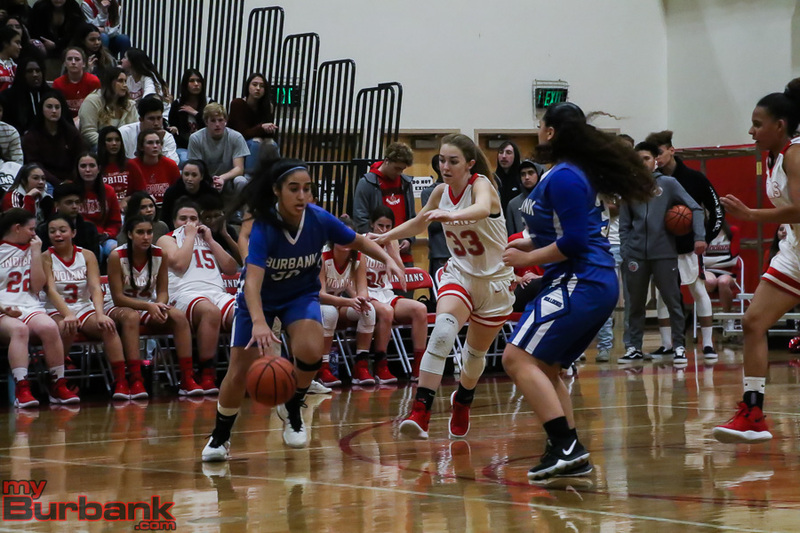 This entry was posted in Girls Basketball, Sports and tagged Burbank High, girls basketball, Jayla Flowers, Osanna Tirityan, Sofia Aslanyan, Sophia Jimenez, West Coast Holiday Festival on December 29, 2017 by Rick Assad. 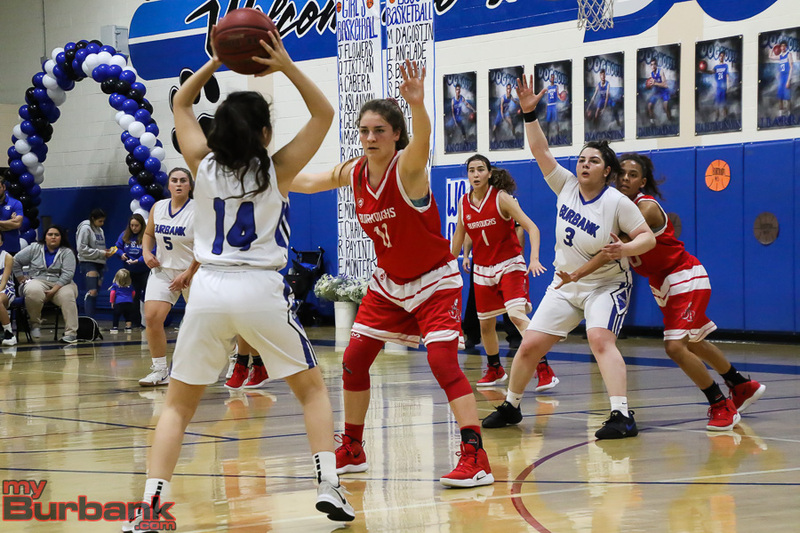 When the Burroughs High and Burbank girls’ basketball teams take the floor, it’s with conviction that every game is winnable. The Indians, 17-12 and 8-4 in the Pacific League, tied for second last season, will be paced by 6-foot-4 senior center Marin Grote and 5-3 junior point guard Arianna Farias. 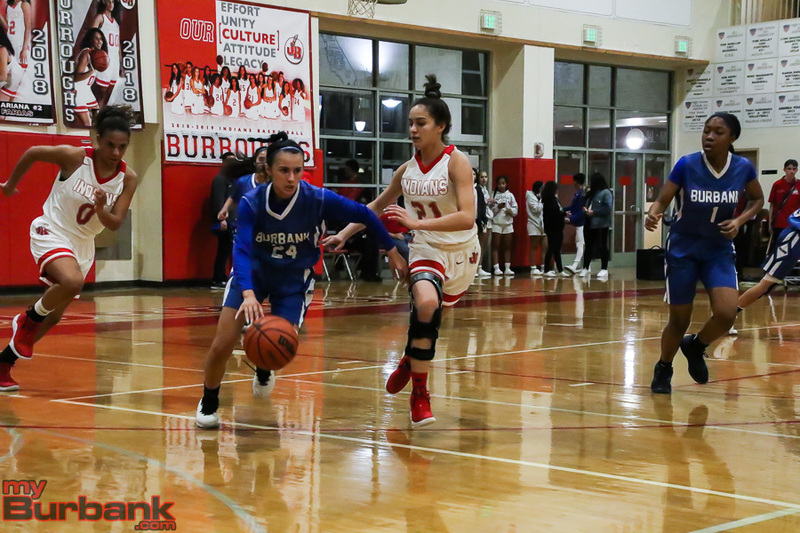 “Both started last year and are expected to lead the way,” said Burroughs coach Vicky Oganyan, whose squad had its four-season run as the league champion snapped. Grote, who will play volleyball for the University of Washington, averaged 9.4 points, 12.1 rebounds, 4.6 blocks, 1.3 assists and 1.1 steals. Oganyan expects the Indians, who lost in the first round of the CIF Southern Section Division I-AA playoffs, to be competitive. The Indians will play in their own tournament and then begin league action on Jan. 3 at Arcadia. 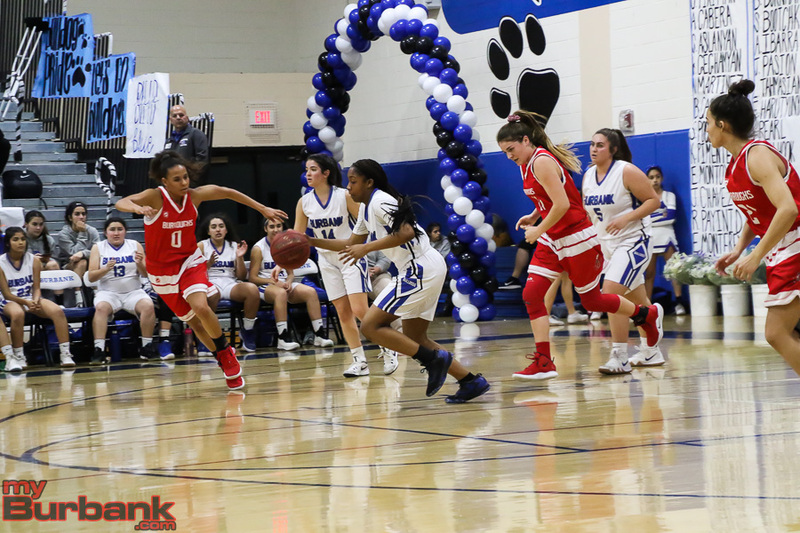 Burroughs will play at longtime rival Burbank on Jan. 19 and host the Bulldogs on Feb. 8. The Indians are loaded with junior guards who spent time on the floor like 5-2 Ayumi DeHerrera, 5-7 Jillian Kukawski, 5-6 Camryn Lotka, 5-5 Emily Gutierrez and 5-8 Nicole Rumfola, who will also see time at forward. “All of these girls have improved and look forward to contributing,” Oganyan said. Senior Jenny Galvan is a 5-3 guard coming up from the junior varsity who should help off the bench. There are a number of talented sophomores such as 5-5 guard A’sia Morales, who is a “slasher, a good rebounder and a great defender,” according to Oganyan and 5-6 guard Sophie Hawkins, who is “being counted on as an outside shooter,” said Oganyan. There are also freshmen and they include 5-7 guard Dyani Del Castillo, 5-11 forward Faith Boulanger and 5-9 forward Kayla Wrobel. “Dyani is a great athlete who is everywhere on the court and a great rebounder, while Faith will be looked at as a scorer and Kayla is a great rebounder and has good instincts for the game,” Oganyan said. Other first-year players include 5-5 guard Liliana Gonzalez, who plays solid defense according to Oganyan and 6-0 Sydney Martin, who will play the post. 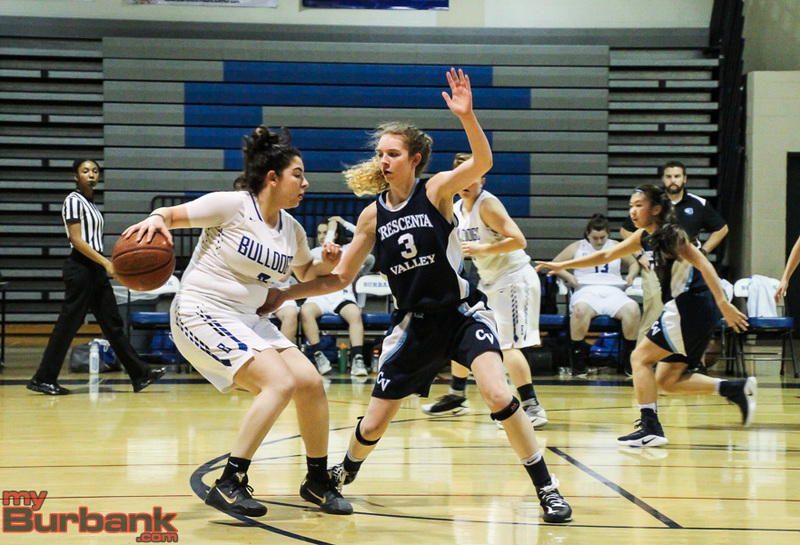 The Bulldogs are coming off a campaign in which they posted a 14-15 overall record and 5-7 in the league, good for fifth place along with Arcadia. The Bulldogs are 1-2 this season with losses to Saugus 52-47 and Lancaster 63-39 in the Brentwood Tournament and a win versus the Archer School for Girls 49-28 in the same tourney. 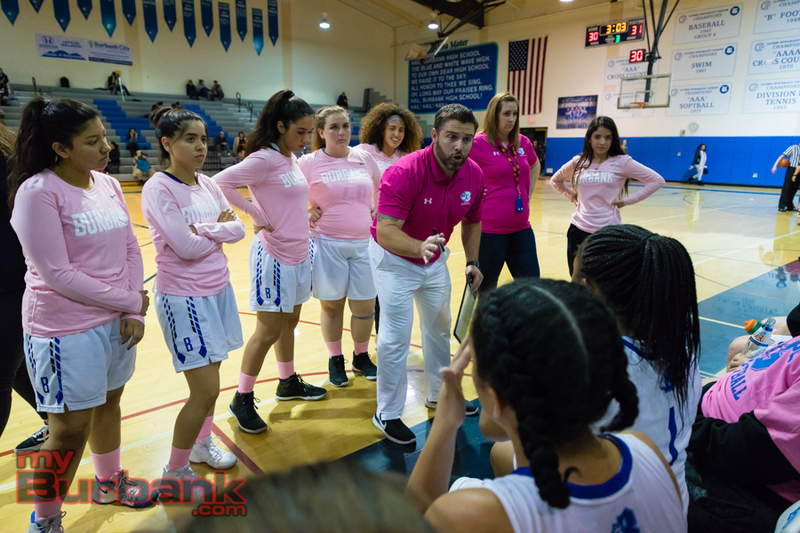 Second-year Burbank coach John Wells said “the league is fairly-well balanced and that no team should go undefeated,” and employs a four-guard offense, hoping this will add more scoring and passing. 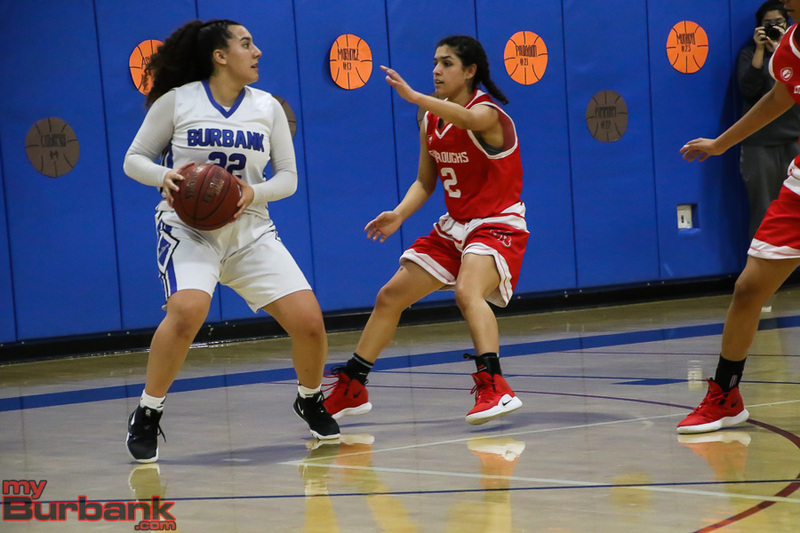 For Burbank, which begins league action at Hoover on Jan. 3, hosts Burroughs on Jan. 19 and visits the Indians on Feb. 8, everything begins with 5-7 junior shooting guard Osanna Tirityan, who has been a force for two seasons. “Osanna is a great scorer and a great rebounder,” said Wells of Tirityan, who averaged 16.3 points, 9.7 rebounds, 2.3 assists and 2.1 steals. “She’s an all-around player. Tirityan has been named to the All-CIF Division II-A second team twice and All-League first team twice. Junior point guard Emily Monterrey, at 5-5, will also have the ball in her hands. “Emily is a strong passer and likes to go to the basket,” Wells said. Senior guard Sophia Jimenez is 5-5 and will add some offensive punch to the lineup as will 5-9 senior forward Kate Lynn Monterrey. Sophomore guard Brianna Castro, at 5-4, is a very dependable shooter according to Wells. The lone forward is 5-9 junior Sofia Aslanyan, who should contribute points and add muscle. Coming off the bench is 5-4 junior guard Jasmine Chavez. “Jasmine is an aggressive defender and a good offensive slasher,” Wells noted. Junior forward Dakota Cortez is 5-4 and can be counted upon to pick up stray balls. Junior point guard Emily Monterrey is 5-5 and a “strong passer and goes hard to the basket,” according to Wells. Another young talent is 5-6 freshman forward Rukhshana Payind. “Rukhshana is a good offensive rebounder who runs the floor well,” Wells said. Freshman guard Erika Montoya stands 5-3, but is still able to make herself into a crafty defender according to Wells. Senior forward Amber Kassens is 5-5 and a relentless worker. “Amber is a good shooter and works hard on defense,” Wells said. Junior guard Desi Gomez, at 5-3, will also be in the backcourt. “Desi is a spot-up shooter and a tough defender,” Wells said. The rest of the squad includes 5-4 senior forward Kaylee Rivas, 5-1 senior guard Abisha Noriega and 5-6 senior forward Sabrina Feldman. This entry was posted in Girls Basketball, Sports and tagged A'sia Morales, Abisha Noriega, Amber Kassens, Ariana Farias, Ayumi DeHerrera, Brianna Castro, Burbank High, Burroughs High, Camryn Lotka, Dakota Cortez, Desi Gomez, Dyani Del Castillo, Emily Gutierrez, Emily Monterrey, Erika Montoya, Faith Boulanger, girls basketball, Jasmine Chavez, Jayla Flowers, Jenny Galvan, Jillian Kukawski, Kate Lynn Monterrey, Kayla Wrobel, Kaylee Rivas, Liliana Gonzalez, Marin Grote, Nicole Rumfola, Osanna Tirityan, Pacific League, Rukhshana Payind, Sabrina Feldman, Sofia Aslanyan, Sophia Jimenez, Sophie Hawkins, Sydney Martin on December 3, 2017 by Rick Assad.